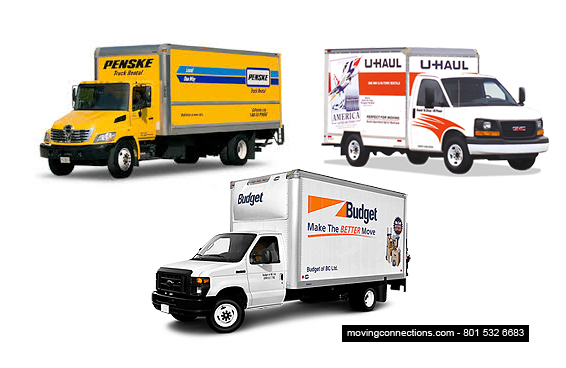 How And When To Use Rental Trucks, Uhauls, Penskes, PODs and Trailers. The first thing you want to do is to organize your move. If you’re going to rent a truck and load and transport your household goods yourself, you’ll want to be certain to reserve a truck well in advance, especially if you’re moving at the first or last days of the month, or during a holiday. Be absolutely certain to reserve a truck that is large enough to accommodate all your goods. One of the worst case scenarios you can come up against in moving yourself is to load your truck to the rafters all the way to the back and then find you still have forty large boxes to load. A good rule of thumb is if you have Studio to 1 Bedroom Apt. use a 10 foot truck, for 1 Bedroom Home to 2 Bedroom Apt. use a 15' truck, 2 Bedroom Home to 3 Bedroom Apt. a 20 foot truck might fulfill your requirements. If you have 3 – 5 bedrooms, you’ll probably be o.k. with a 26 foot truck i.e. Uhaul truck sizing or Penske. This all depends, however, on whether you have a lot of stuff or just a little. Home gymnasium equipment, gun vaults and grand pianos tend to take up a lot of space and could put you over the weight limit quickly. Note that one company’s 26 foot truck might only offer about 1600 cubic feet of interior space, while a competitor’s might offer 1700 cubic feet of interior space, depending on year, make, and model of the truck. You MUST stop at every open inspection station when you cross a state line. If you’re over the weight limit for your vehicle, you’ll have to remain at the station until you unload enough of your goods to bring your vehicle under the limit. This would probably require you to call for an additional rental vehicle or trailer with all the extra expense and time that this procedure will require. In addition, you could receive a heavy fine. Also, you cannot transport hazardous materials, so don’t try to load anything flammable, explosive, corrosive, poisonous, toxic, or otherwise dangerous. Lawn mowers and other such equipment should be drained of all flammable fluids (you might want to run your lawn mower until it runs out of fuel). Another thing that you might be required to abandon are plants or the fruits of plants (such as oranges) when you cross state lines. Lift gate or loading ramp? Many people use and prefer loading ramps. Others prefer to use lift gates, which are large, motorized gates attached to the back of the truck. These are like an elevator for household goods. Either has advantages and disadvantages, and you might want to talk with a customer representative from a truck rental company to help you make a decision as to whether you’d be better off with a ramp or with a lift gate. Whatever kind of truck you rent or use, be certain that it has reliable tie-down rails along the inside walls. These allow you to strap or tie your larger, heavier goods to the interior walls so that they don’t shift or bounce and therefore damage themselves or other items. If the truck doesn’t come with a lock for the cargo gate, you should purchase one if you’re going to make any stops, especially overnight stops. While it isn’t foolproof, it does provide a measure of protection against theft. If you want your move insured, the truck rental company will probably offer you various plans for covering the vehicle and its cargo. But be careful to get details in writing. For instance, one company (and perhaps others or all) doesn’t cover any damage to the truck that occurs above the cab level. So if you run into a low-hanging tree limb and it smashes the cargo area of the truck, you’re not covered even though you purchased extra insurance through the company for the vehicle. Also check for deductibles. Be certain what, exactly, your cargo insurance covers. Does it cover damages, or only loss from theft, or whatever? And check what liability coverage you have for death or injury. Etc. Note: You don’t need a commercial driver’s license for a 26 foot truck, but you will for anything larger than that. Load your heaviest and largest and most expensive items along the sides of the truck. The rails along the interior sides of the truck are there so that you can strap such items securely and snugly to the walls. As stated before, you will want to make certain that each such item is stretch wrapped with several layers of wrap around all sides, then put moving blankets or moving pads around them also. You can tape the blankets or pads to keep them from sliding off. Then secure the item to the interior wall of the truck using straps. For very short trips, say, within your city limits, you might get away with using ropes to secure items to the walls of the truck. But ropes can tend to loosen and stretch, with the result that a piano or other such object will start to roll or tip, causing extensive damage to itself and to other items in the truck. So it’s best to invest in some moving straps that are made expressly for the purpose. After you have put the large, heavy objects in the cargo area and have strapped them securely to the walls, you can start to move in our boxed goods. Put the heavier, larger, well packaged items in first, then stack the lighter and more delicate items securely on top as you go, working from side to side, bottom to top, then front to back, a row or two at a time. Continue working this way, making certain that your load is stable and has no significant gaps between boxes. This will contribute to the stability of your load, ensuring that no damage occurs to packages smashing into each other, or falling into empty spaces as the load shifts from the vibrations and bumps of travel. Of course, you can avoid much of the hassle of a move by hiring a reputable moving service. First, be certain that the company you hire for your move is licensed, bonded, and insured. Then you can select from among the services they offer, such as a labor only move, in which their workers do all the packaging and heavy lifting and loading. Then you drive the truck that you provide. Or you can select a full service in which the moving company provides the truck and the labor, including packaging and loading/unloading. Do keep in mind that if you package an item yourself (as opposed to letting the moving service do this), your items will not be insured for damage. So you can package all the items you want, but they won’t be insurable. It’s also good to keep an inventory of everything important that you’re moving, and go over it with the movers. Also, take pictures on your cell phone (or with a camera) to show what scratches and dents, etc., your appliances, furniture, pianos, etc., have or don’t have before the movers touch them. That way you have some proof of the condition the items were in before the movers started to handle them. Also remember to tell the moving company in advance of any large, fragile, or high value items that you want moved. Describe them in some detail so that they can make preparations for them, as they will probably need specialized equipment and extra crew members to prepare and load the items. While the above tips can be very helpful in getting ready for your move and making it much smoother, it’s by no means an exhaustive list. If you have any questions or concerns, it’s best to talk with professional members well before the day of your move. If you decide to rent a PODS moving container for your next move, you’ll certainly save big bucks compared to hiring a professional moving company like Moving Connections. In fact, renting a portable moving container from PODS or our moving trailer for an interstate move will cost you a fraction of what a full-service moving company would cost. In addition to saving you money on a move, these portable moving containers and trailers can also be used to temporarily store items during the moving process. For these reasons and more, moving containers and trailers have become one of the most cost-efficient and common sense ways to move to a new home. If all this seems overwhelming don't worry. Moving Connections will supply the labor to Load and/or Unload your Uhaul and Penske Rental Trucks as well as your PODS and Trailers. Book your Labor Only help 6 days a week.